Innovative technology senses the actual temperature inside the pot for precise cooking. Multi-function cooker with 19 programmed settings. Continually senses the temperature inside the cooker to assure the exact pressure is maintained for precise cooking no matter where you live. Unlike other pressure cookers, no altitude adjustments are needed. Up to 70% faster than ordinary cooking methods. Save time, energy, and money. Digital display and control knob make setting easy. No complicated buttons. Easy to set! Large digital display and control knob let you easily scroll through the programmed options as they are displayed on the LED screen. Just set and the rest is automatic! Pre-programmed for easy pressure cooking. Automatically maintains the proper temperature while cooking then reduces the pressure and switches to keep warm when cooking time is complete. Quick pressure release valve for fast pressure reduction. Nine built-in safety features including cover locking system. 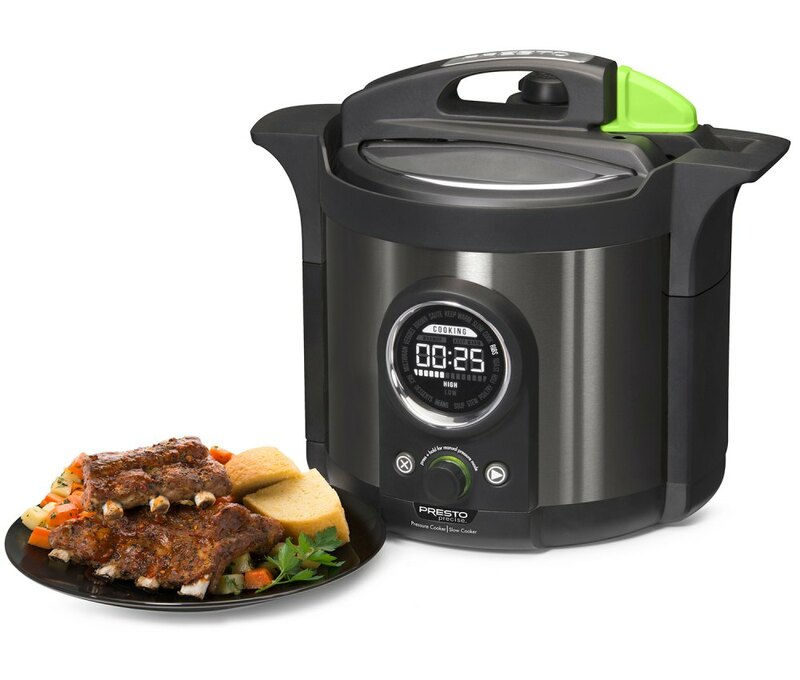 Doubles as a slow cooker, rice cooker, steamer and more. Black stainless steel exterior. Includes rack for cooking multiple foods plus a comprehensive instruction/recipe book. Removable pot with nonstick surface inside and out for easy cleaning. Dishwasher safe. Scroll to select the pre-programmed settings. No need for complicated buttons. Senses actual temperature to maintain proper pressure for precise cooking. Quick release valve for fast pressure reduction.